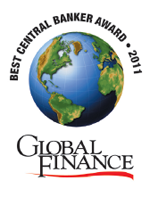 New York, August 25, 2011 - Global Finance magazine has named the heads of the Central Banks of six countries as the World’s Best Central Bankers over the past year. *A governor for the designated country was rated; however, there was a different governor in 2010. **A governor for the designated country was not rated in previous years; this is the first annual rating.